Mix dry ingredients in the bowl of a food processor. Add the butter and process until the dough resembles coarse meal. Whisk together eggs, vanilla and zest. With processor running, pour in wet ingredients and process until dough turns into a ball. Turn out the dough and knead until smooth, 2–3 minutes (at most). Flatten into a round disk, wrap in plastic wrap and refrigerate for at least 30 minutes. Roll chilled dough into a disk and fit into a 8-inch tart pan. (There may be excess dough.) Trim edges and prick the crust with a fork. Weigh down crust (with pie weights, an empty pie tin, or parchment paper held down with dry beans). Blind bake at 375 degrees for 8–10 minutes, remove weights and bake and addition 8–10 minutes or until golden brown. Remove from oven and allow to fully cool. In a non-reactive saucepan, whisk together egg yolks and sugar. Over medium-low heat, stir in butter lime juice, lime zest and salt; whisk until smooth. Stirring constantly, cook until curd thickens slightly and becomes opaque. Do not boil. When the curd clings to the back of a spoon, it is done. (It will be yellow. If you want a green curd, add a drop of green food coloring.) If it appears lumpy, pour through a strainer. Allow to cool. In a medium saucepan, whisk together cornstarch and sugar. Stir in liquids and cook, over medium heat and stirring constantly, until the mixture comes to a boil and becomes clear and thick. Pull from the heat and pour in all the kiwi. Toss fruit in the glaze until coated. With a colander, drain the kiwis. Allow to cool slightly. To assemble the tart, spread cooled curd into the tart shell. 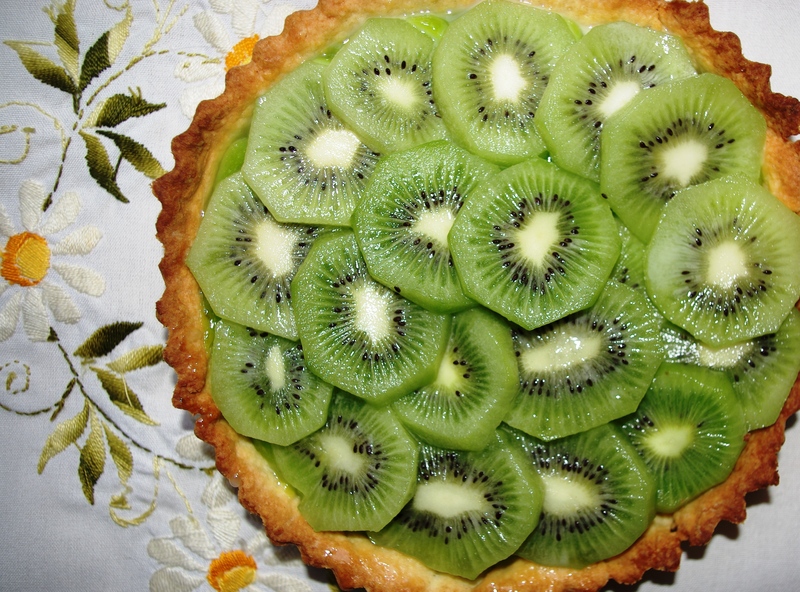 Decorate with kiwi, placing them in a layered circle around the outside of the tart then into the center. Chill thoroughly and serve with whipped cream.